Have you got your tickets yet? 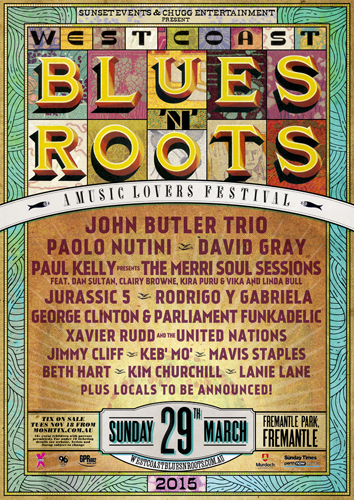 Fremantle’s favourite music festival the BLUES&ROOTS is on in 11 days, Sunday March 29 with the John Butler Trio, Paolo Nutini, David Gray, Jurassic5, Rodrigo Y Gabriela, Paul Kelly, etc.etc. It’s on in Fremantle Park, so don’t miss it. The 29th is going to be a very busy Sunday in Freo that will hopefully boost the coffers of our retailers. The Corporate Challenge is on early in the morning and the Fish Festival at Bathers Beach will be the grand finale to the Sculpture@Bathers art exhibition. 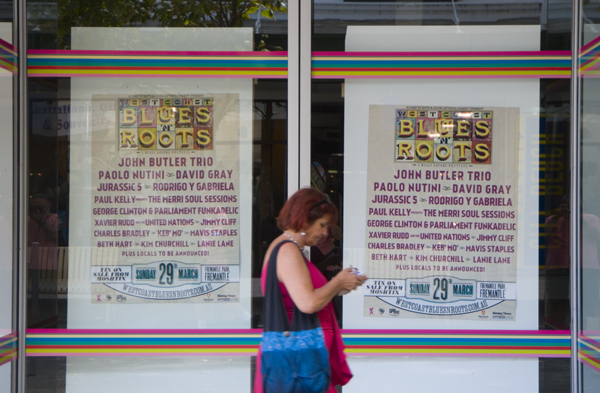 It is nice to see that Fremantle locals John Butler Trio are the top billing of BLUES&ROOTS 2015 on March 29. Paolo Nutini, David Gray, Jurassic 5, Paul Kelly, George Clinton, Jimmy Ckiff, Mavis Staples, etc. The Blues&Roots have become a great yearly tradition in Fremantle Park, so something to look forward to already. Tickets for it are good Christmas gifts and can be ordered on line. Check out the Facebook page or Google.